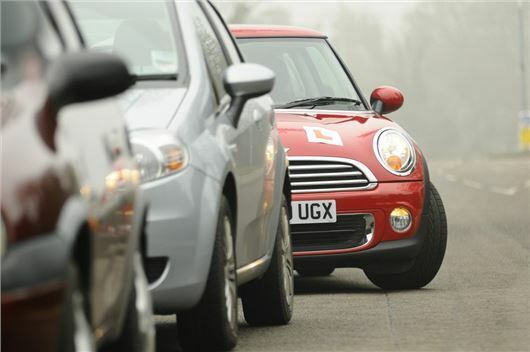 Young people are giving up on the idea of learning to drive, according to research by HonestJohn.co.uk. We analysed DVSA records from the past 10 years and found that the number of 17-year olds taking the practical driving test has fallen by more than 100,000, since 2007/08, while the overall number of young people (17-25) in the UK learning to drive is down by 20 per cent. East Sussex has seen the largest average drop in young people taking the driving test, with a fall of 61 per cent, while the County of Bristol is second with a decrease of 45 per cent. Cambridgeshire and the Vale of Glamorgan are joint third - at 40 per cent. Worcestershire completes the list, with a decrease of 39 per cent compared to 2007/08. Recent figures show that a city-based teenager driving a small hatchback worth £8000 can be quoted up to £13,498 for a comprehensive 12 month insurance policy, while those living in rural areas will be asked to pay up to a staggering £8750. Average premiums increased by eight per cent in the first quarter of 2017, with accelerating costs being driven by Insurance Premium Tax (IPT), whiplash claims and changes in the way compensation is calculated. Over the past few years the IPT rate has doubled to 12 per cent, netting the Government an estimated £5.8 billion a year. As well as sky high insurance costs, an average learner is required to pay £1529 to get their licence, with the Department for Transport claiming that a typical passer requires 47 hours of professional tuition to get their licence. Driver and Vehicle Standards Agency records show that while the average pass rate for the driving test has increased since 2007/08, from 44 to 47 per cent, the overall number of tests conducted has fallen significantly, from 1.8 million to 1.5 million, with young drivers accounting for the majority of the drop. They just buy a fake licence instead and clone a set of plates. It's insane what has happened in the UK with a handful of insurers basically operating a cartel to rip motorists off. I live in America where they teach 'drivers ed' as they call it at school and it's normal for my colleagues kids to show up driving a brand new Jeep Cherokee or in one memorable case a Corvette. The US insurance companies are not going bust so there's obviously something more at work here. US motor insurance often a fixed limit on payout, with the ever present legal system ready to step in and sue for any difference. California minimum requirement is $15k for personal injury, $5k for property damage. UK minimum requirement is 3rd party liability - no limit. Friends of ours live part of the year in Florida. Their 18 yo son drives a Nissan GTR (modified to over 600bhp) over there. The insurance was incredibly low. Part of the reason is said to be because they insure the person and not the car. I believe the 6 month service interval was more of an issue. He drives BMW 440i (modified) over here so you can guess that the pennies are not an issue! I worked in insurance for 25+ years - we picked up the big motor claims as a reinsurer of motor insurance companies. As one of the other people mentioned, in the UK 3rd party liability for injuries in motor accidents is unlimited. When I left there had been 2 single person bodily injury claims paid for £15m each; ironically neither involved a young driver. But young drivers, especially male, are a horrible risk. Inexperience, bravado, peer pressure are all causes of accidents - and the car may well contain several young people. It's normally FAR more expensive when someone is seriously injured than killed - cost of care, loss of income etc. Those insurance figures are headline-grabbing but far from reality. As long as you pick the car correctly (i.e. in insurance group 1 or 2) and get a black box fitted, then the insurance will be in the £1000-1500 range. I think that a better explanation is that it is a lot of money to spend for something that they will only use occasionally once they go off to university. Many teenagers I know are just delaying driving, as they don't need a car at uni and Uber is much cheaper when they need to get around at the weekend. I believe that making the theory and practical driving tests much harder over the years has been a deliberate government policy to stop so many new drivers getting onto our already heavily congested roads. This coupled with the increasing cost of running a car all helps to clear the roads a bit so the wealthy can get around easier. Motoring is more and more just for the well off with every passing year. Working people used to drive cars around 5 years old now they are 10 years old at least, we'll soon be priced off the road completely and don't get me started on the cost of car insurance! "Young people are giving up on the idea of learning to drive, according to research by HonestJohn.co.uk." Did the research ask whether none-the-less they were getting behind the wheel unlicensed - and presumably uninsured? I think we should be told! Significant policy implications depend on the answer. I think the big problem is parking. My son lives in Drayton Park (Islington). He is 26. If he owned a car where would he keep it? He owns a bike and that is kept in my garage (in Enfield). He shares his flat with 2 other guys, neither are car owners. All 3 could afford a car, but parking! I used to play football, 35 years ago, all our team had cars, we'd meet at Turnpike Lane and leave 3, 4 cars there as not needed. My son plays hockey, maybe 2 cars in the team. They have to go by train all over, Reading, Canterbury, Surbiton, always by train. Sometimes, 1 or 2 of em, might train out to the suburbs (Southgate or Enfield) and borrow Mums car for the day, to drive to some awkward to get to match. Parking, that is the problem. I think so many young people aren't getting a car as they see it as a hassle and doesn't deliver many benefits to an urban dweller. They need to be able to get around and be flexible but also might want to be able to do routes that take them right into city centres where parking is either nonexistent or at least unpredictable or they may want to go for a drink en route if friends suggest it. The effect of smart phones I think allows people to change plans (or have their plans changed for them by their friends) meaning using a car all day is less flexible than Uber. 10% of cars in British inner cities are uninsured and a higher % in inner London. This aside the best solution against exploitive insurance companies is for young folk simply to invoke the laws of supply and demand. No demand = low prices .low prices= high demand and eventual market equilibrium.